The HPI Baja Q32 is an exciting new micro buggy that has some full size RC car aspirations. For the low price the package look to be really well equipped, and it offers something called 'Real Steer' with provides some proportional steering, something that many of it's direct competitors do not. I've never had a Baja 5b, so I was interested to see if this (very) little brother would give me a taste of the classic Baja 5b spirit that has earned it such a legendary status in the RC scene. When the boxed arrived I soon opened it up to take a look inside. Take care with the packaging as part of the internal packing also acts as a ramp. 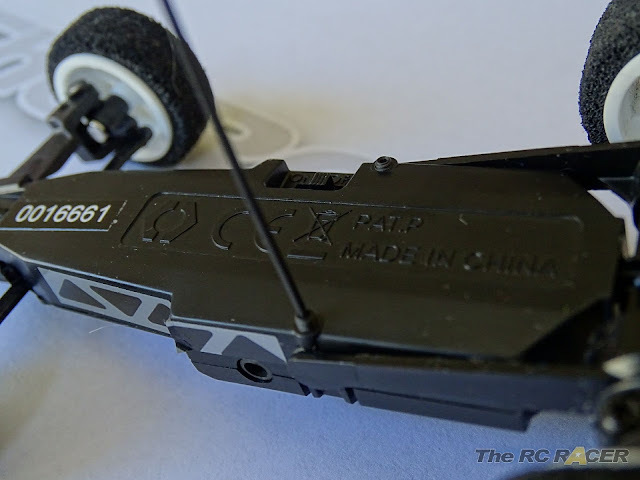 The package contains the chassis, bodyshell (painted black), decals instructions and 8 orange plastic corner markers, allowing you to be able to set-up a track anywhere that takes your fancy. The chassis is already pre-assembled. The front arms are flexible, and the rear has a pivot spring and two rear links hold the rear pod in-line with the main chassis. You can press down on the car and the movement feels firm, but there is some movement there. 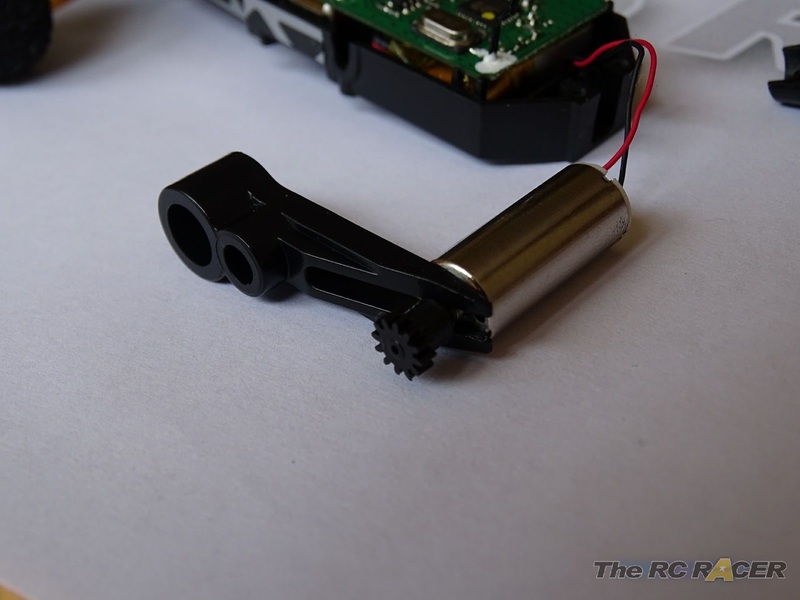 The coreless motor drives a solid rear axle. giving the small car a solid feel on acceleration. The spool will also be bullet-proof for all of the abuse a car like this will take. A solid axle will affect the turning radius, but there are tuning options to counter-act that. The TF-60 controller takes 4 x AA batteries. The unit has trim for the throttle and for steering. Adjusting the trims is fine, but the steering trim is only for very fine adjustments. 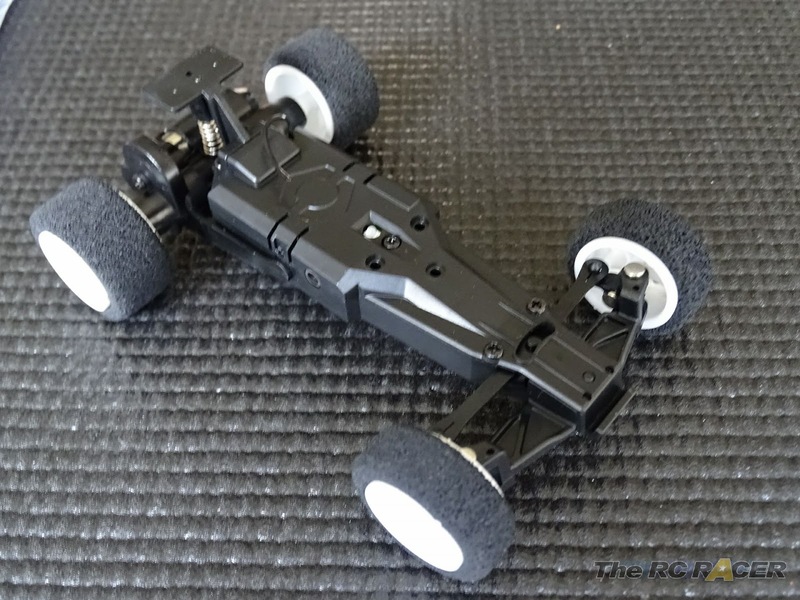 The Q32 chassis has a manual steering trim on the underside of the car. 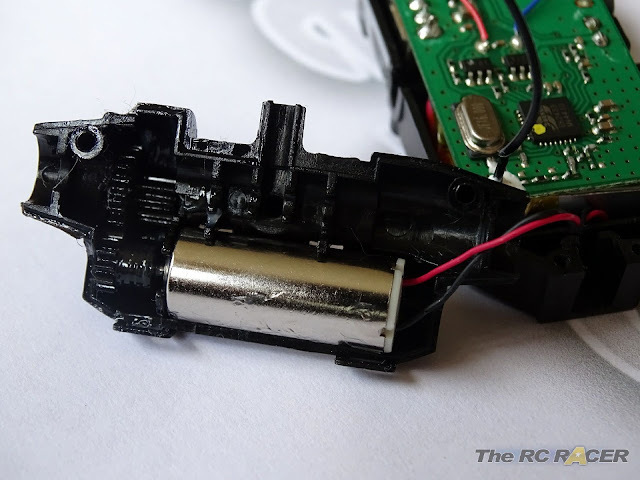 (Note - When using the steering trim on the controller you might hear a droning sound coming from the car, if this is the case, just change the trim on the chassis and wind out the transmitter trim so the droning stops). The controller is easy to hold, and a good size for all ages. The unit is pretty easy to hold for children and adults alike. 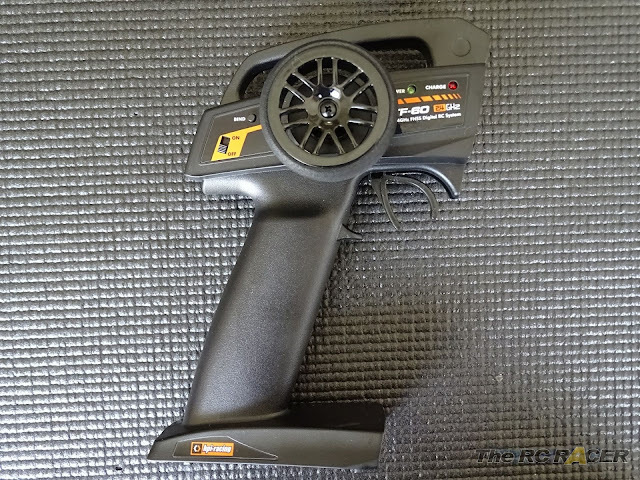 The wheel feels sturdy and the trigger is light. The TF-60 also acts as a charger for the car. Charging is easy, and takes approximately 40 mins for a full charge. You simply need to ensure the car is switched off and then plug in the lead. Here you will see the charge light appear on the controller. Charging takes about 30-40 mins and you can tell when the battery is fully topped up as the red charge light will switch off. An optional USB charger is also available. I also have the optional USB charger (HPI # 114259), this allows you charge your Q32 from your laptop etc and can help save the batteries in the controller. Whilst the car is charging, it's time to work on the body. 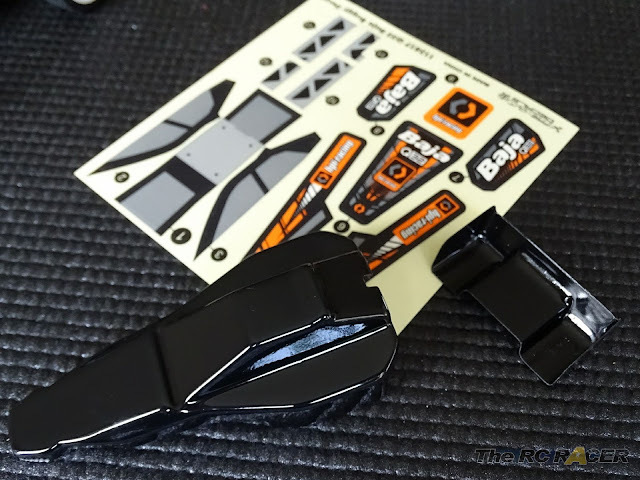 The car comes with a pre-painted black shell and a set of decals to apply. Once of the cool things about this car is that you can also buy a clear shell (HPI #114283 body and wing set) that you can paint yourself. I will not lie, it was quite hard work to mask the little shell (It also doesn't come with the usual plastic outer overspray coating). However I wanted clear windows so I endeavoured with my masking and here is the final result. Once you have finished the shell you then just need to attach it to the chassis. The shell simply fits to the chassis with the included Velcro strip. So the car is all ready, and you can just marvel at the little thing, its only 109mm long and 79mm wide. 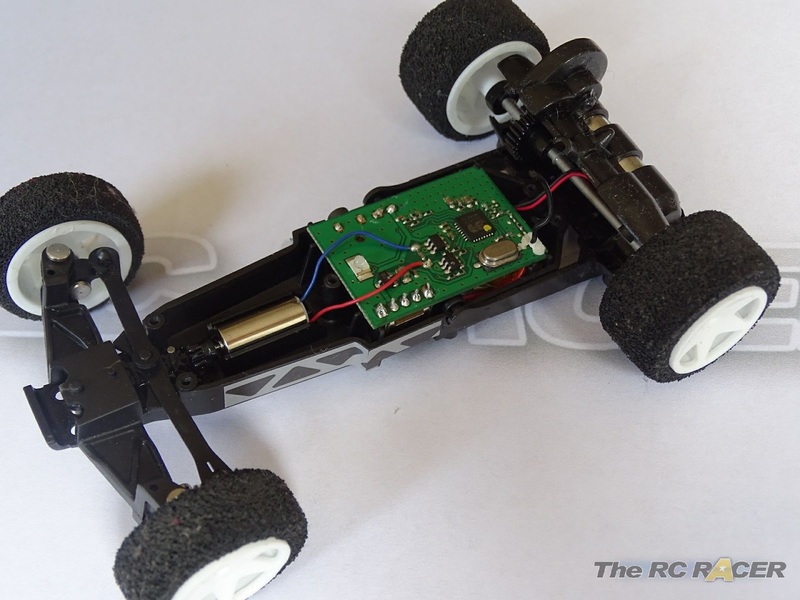 With the battery charged and the shell all assembled I drove the car around my lounge. First up I ensured the car tracked straight by adjusting the trim on the chassis once this was done I was ready to see what this car could do. The speed hits you instantly, the car is really quite quick for something so small. The throttle control feels very linear and it is responsive to the squeeze of your throttle finger. 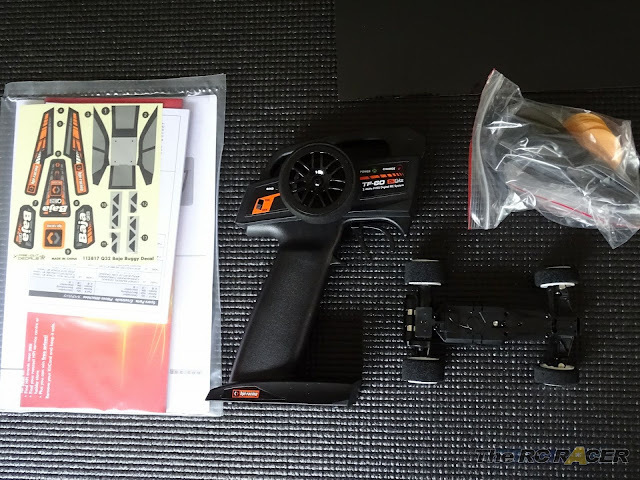 The steering is very quick and the Real steer does give you a range of steering, it's not as precise as a true steering servo, but it does give you enough of a range of movement to allow you to take different lines as you try to get the best speed around one of the enclosed corner markers. Soon I set up a course featuring the included cardboard ramp (Part of the packaging that has a secondary use). The car took the jump with ease, and was also easy to control in the air and well balanced. The car was great fun, the tyres were slipping a little on my wooden floor, so I jumped it onto a large rug and the car easily coped with the different terrain, and if anything it actually felt a little better on the carpet. The battery lasts for about 7-10 mins and then the low voltage kicks in and the car stops. I raced it around my lounge for a few more batteries, and also tried to keep it from the clutches of my rather keen pet dog! Now though I wanted to see what else I could do with the car. 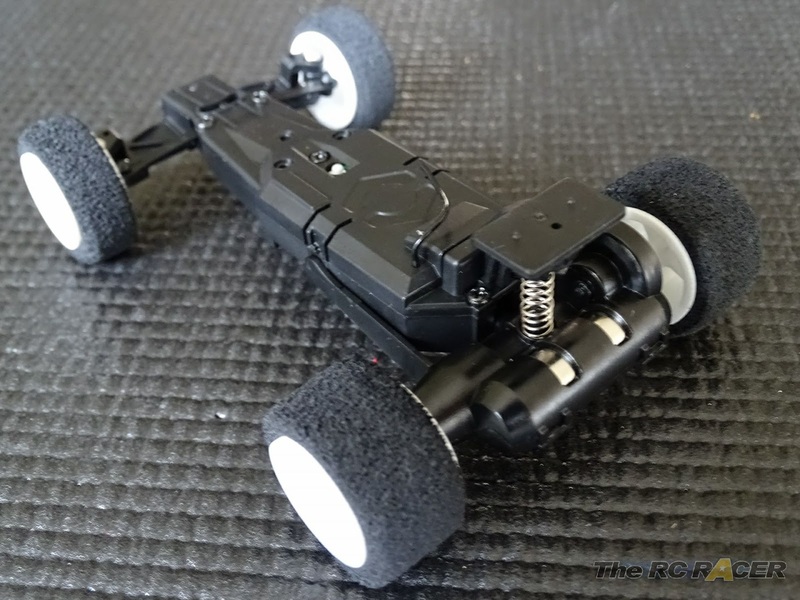 One of the intriguing things about the Q32 is that HPI offers a range tuning options for this little car. 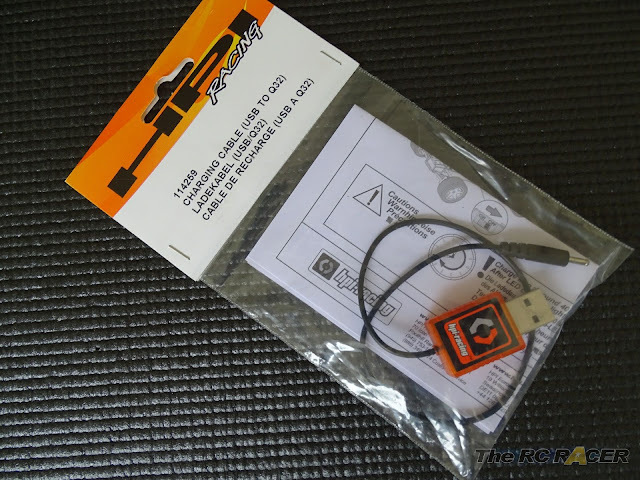 (HPI official tuning options). 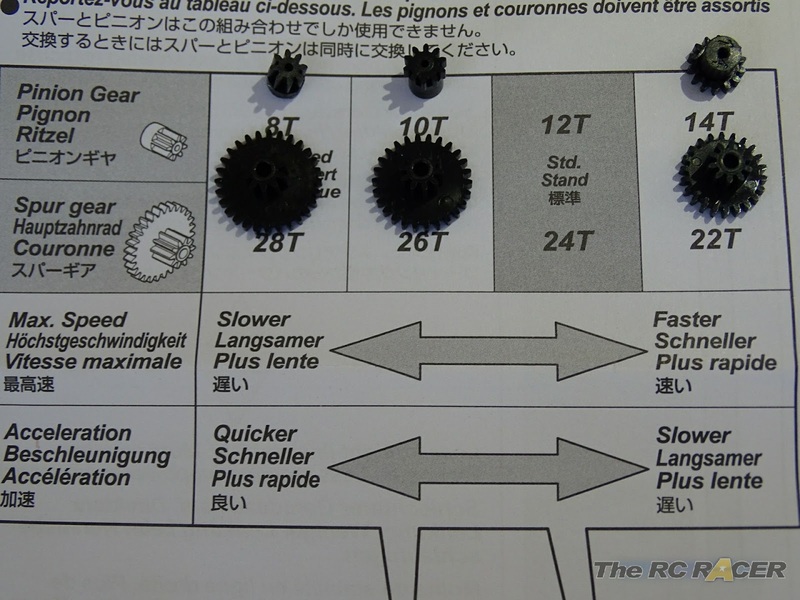 The part that appeals to me was (Part no #114265) This is a High speed gears / Stability tuning set. It's hard to resist buying an option part that says high speed on it! 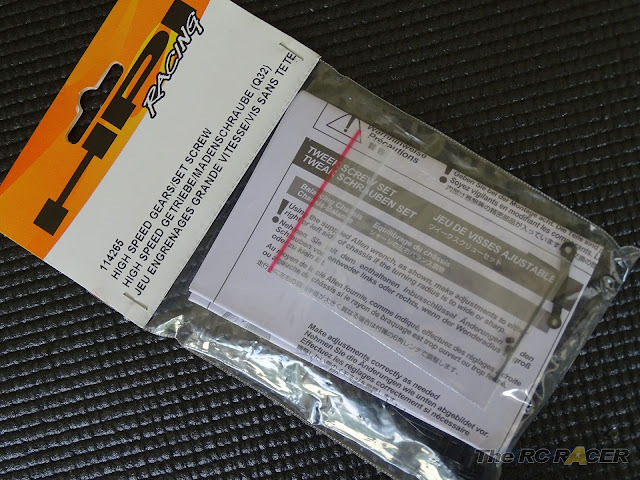 This pack is reasonably priced and there are 3 main areas that it allows you to tune. These are small but they make a massive difference. The tweak screws simply fit into the allocated chassis screw holes underneath the chassis and you can change the left and right turning radius of the car by adjusting the amount they are wound in. Tightening the screw will make that side turn wider, loosening it will make it turn sharper. My stock car turned sharper to the left than the right. I simply tightened the screw on one side to adjust it to match the turning radius of the other side. Next up is a set of replacement front steering arms that give the car different toe out adjustments. The car has 0 degrees of toe out when you get it, this makes it nice and stable. Adding more toe out will give you more initial steering into a corner, but a little less when coming out on power. It also sacrifices a little bit of stability. The kit comes with 2 pairs of arms that will allow you to have 1 or 2 degrees of toe out. At the moment on my car I have 1 degree of toe out as it seemed to give me the best balance out of those options. 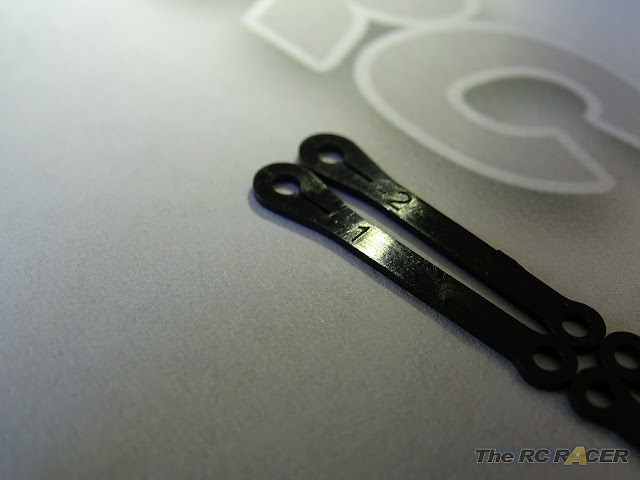 The final part of the pack provides you with a set of spurs and pinions that you can swap in the car to change the speed and acceleration of the car. Each spur and pinion needs to be matched. The gears are matched, and you need to ensure the correct spur is fitted with the matching pinion. To do this you need to open up the car. Top half removed, you just need to un-clip the rear sections. Disassembly is easy, there are several small screws that you need to remove. You do need to be careful with the motor wire as that is quite thin. Once it is all apart you can use the included multi-tool to change the pinion. Slide it under to remove the pinion without bending the shaft. Notice how the car already has grease on the moving parts. 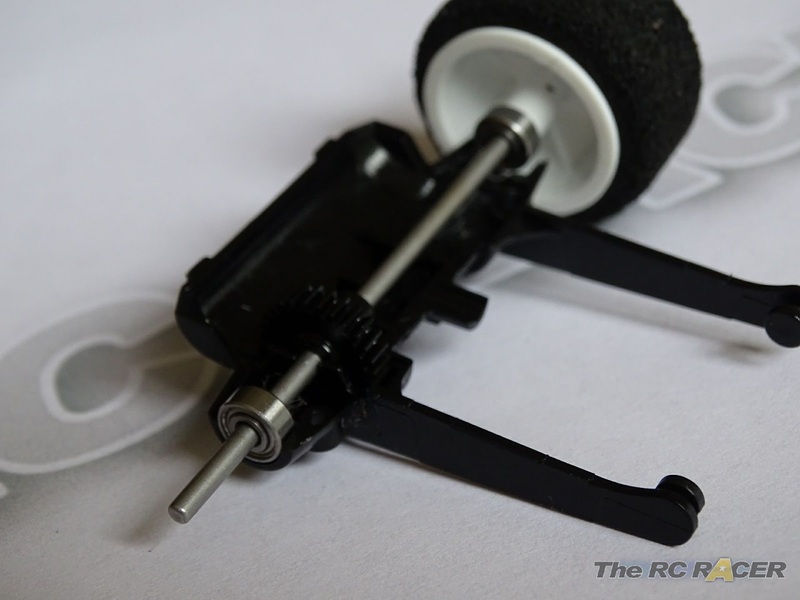 Once you have done this you can swap out the spur and carefully assemble it. I fitted the fastest gears as I wanted to see how quick this car could go, also the car did wheel-spin a lot on my wooden floor so I hoped the slower acceleration could reduce this and make it more stable when I press the trigger. Whilst the car was apart, I noticed that the rear axle had two bushings on it. I replaced them with some 620 size bearings. These bearings are very cheap to pick up, and they will give you a fraction more speed and longer battery life as they will reduce the friction that the motor has to contend with when spinning the axle. The car was now fully re-assembled and I was itching to test it out. 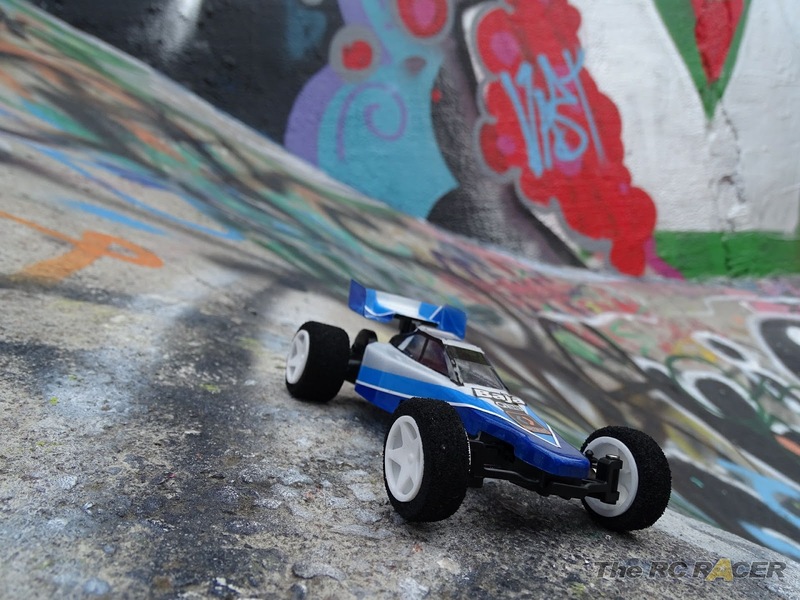 The HPI Q32 is a little car with big intentions and I thought it would be interesting to really test what it can do on our top secret RC stunt park. It had been a typical British summers day so there were a few puddles around but that didn't stop us. The car was excellent fun, the speed that it got up to was impressive for a small car and the grip of the kit tyres was impressive, once they got a little wet they became a little slippery, but thanks to the real steer technology I was able to add just a little opposite lock to the car to try to reign it in. We were really impressed on how well the car sprinted around the track and also how it handled jumps. Here is a little video of the car in action. 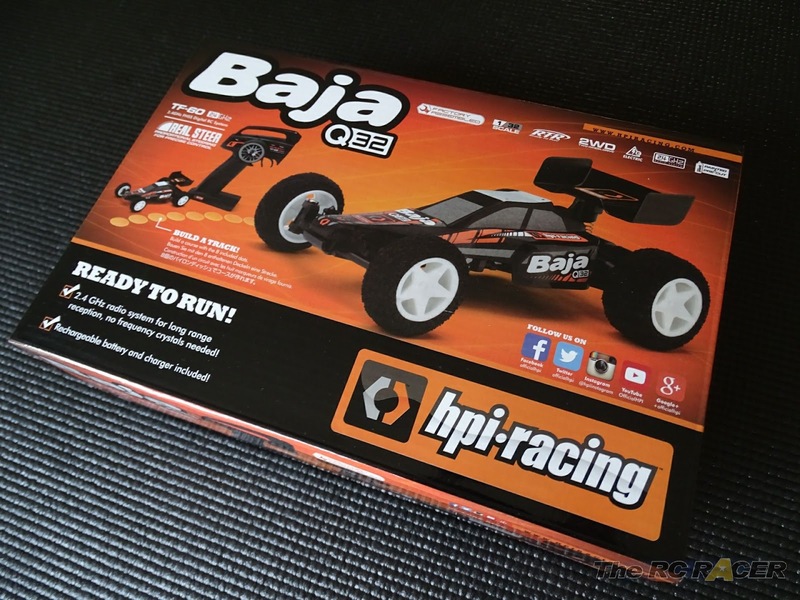 The HPI baja Q32 is already proving popular, and it's easy to see why. 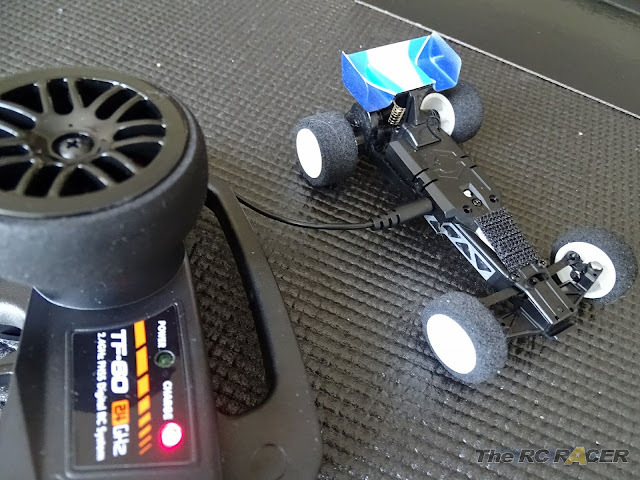 This little knock about buggy feels more like a 'Proper' RC car thanks to the 'Real steer' technology and the extra optional tuning ability. The car is strong, I have been giving this little car an almost daily thrashing and I have had no breakages or faults with the car. If I did there are a wide range of spare parts available for it direct from all HPI stockists (See here for Spares). I've already seen races with these cars between drivers in between heats around the pit area, and I can only seeing this becoming more popular. 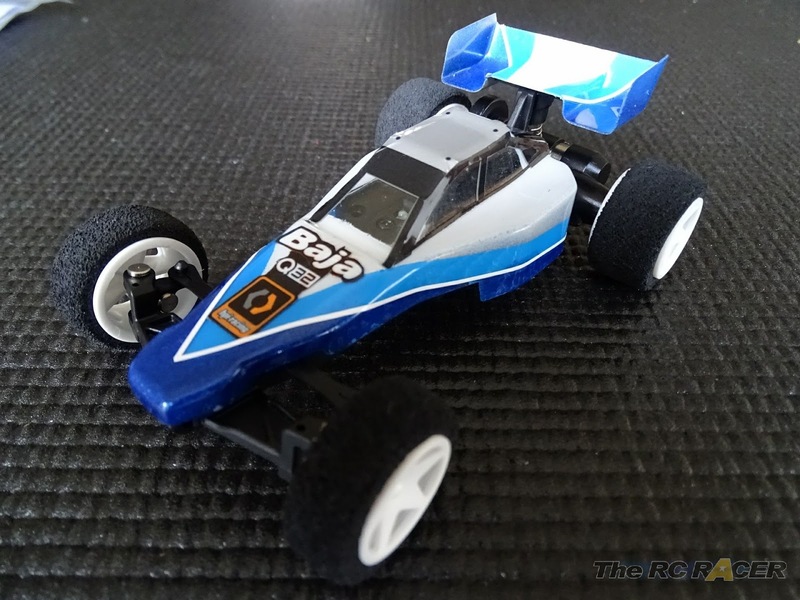 The HPI Baja Q32 is a great value for money little car that can give you some satisfying RC action on demand wherever you are. Available from HPI and all HPI stockists. 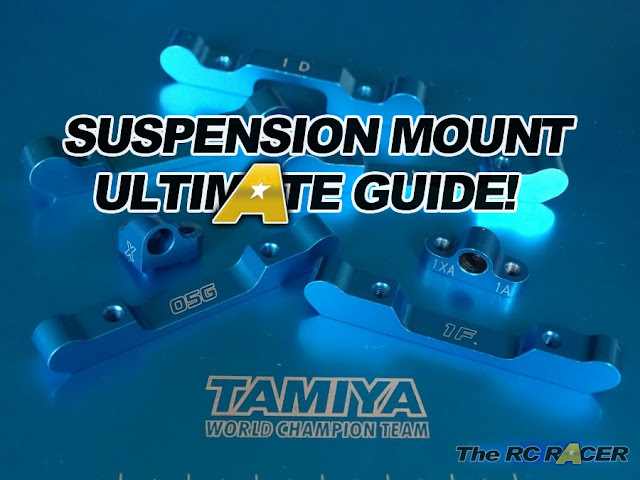 Any links for the bearings used? I can't seem to find size 620 bearings. They seem to be in mm when they are that small.